One synchronous generator is to be synchronized to the grid. Two systems are to operate in parallel. Two transformers are to operate in parallel. Connecting two different lines originating from the same source. In a three phase system the voltage or current sinusoid attain peak values periodically one after another. The sinusoid are displaced 120 degrees from each other. So also phasors representing the three sinusoids for voltage or current waves of three lines are phase displaced by 120 degrees. Now the question arises what is the sequence ? In which order the voltage or current waves attain the peak values cyclically. In the diagram just look at the ABC Anti Clock Wise phase sequence. Here the phasors are rotating in anti clock wise direction. An imaginary viewer(see figure-A, left ) will encounter first phase A, then B, then C again A, then B.....like wise.The sequence is ABCABCABC....... or ABC Anti Clock Wise sequence . You might imagine about the possibility of phase sequence ACB Anti Clock Wise. Yes it can be! In this case the phasors rotating the same anti clock wise direction the imaginary viewer(see figure-A, right ) will encounter first phase A, then C, then B. So here the sequence continues like ACBACBACB...... .
You might think that in anti clock wise rotation, do the other sequences possible? you may think why not BCA or BAC or CBA or ......? From the above ABC sequence if you start from B then you can see that BCA is nothing but the same ABC sequence. Similarly BAC and CBA sequence are the same as ACB, only we started from other phase. Note: If you studied permutation and combination maths then it is easier to appreciate the case. 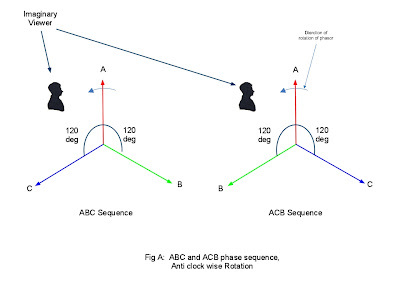 Hence it is clear that for anti clock wise rotation there are two possible phase sequences ABC or ACB. Why anti clock wise ? yes it is the convention mostly used. Just recall the school maths when you always measured the trigonometric angle starting from positive x-axis in anticlockwise direction and called it positive angle and in clock wise direction the angle is negative. Accordingly the sine wave is drawn. This is the reason why anti clock wise rotation is so prevalent. However the Clock Wise ABC and ACB phase sequence can also be used. The phase sequence identification is purely a convention. It helps in identifying the sequence in which three phase voltage or current attain the peak values. The Anti Clock Wise ABC is equivalent to Clock Wise ACB. Just analyze by placing the imaginary viewer and rotating the phases in respective directions. When any two of the three phase conductors connecting to the three phase induction motor is interchanged the phase sequence of the supply to motor is changed. This results in the rotation of motor in opposite direction. Actually this is the principle used in mechanical phase sequence detectors. The same direction of rotation means same phase sequence. These days solid state sequence detectors are increasingly used. In some regions of the world other letters may be used for phase sequence, like L1L2L3 or RYB. It is really confusing when synchronization of two different systems are considered. In real world, before synchronization or paralleling, the two sides phase sequence is identified by using the same sequence detector. If the same direction of rotation is observed for both sides by the detector, then they are marked accordingly for same sequence. Of course only same sequence is not sufficient. It is also ascertained that terminals of same phase are connected together. "Why anti clock wise ? yes it is the convention mostly used. Just recall the school maths when you always measured the trigonometric angle starting from positive x-axis in anticlockwise direction and called it positive angle and in clock wise direction the angle is negative. Accordingly the sine wave is drawn. This is the reason why anti clock wise rotation is so prevalent." if anti colck wise ABC is equivalent to anticlock wise ACB ,then why do we need both? is there any significance? Thank you for your answer.Now I knew. Thank you for your answer now i knew what is phase sequence. A generated 3 phase is meant to have 3 waveforms. Seen on an oscilloscope, it will be apparent that the 3 waveforms are spaced 120 degrees apart, and there is a definite sequence. If the waveforms are identified as A, B & C in the sequence as they appear on the oscilloscope in time, then the supply conductors supplying these waveforms must necessarily be identified as A, B & C respectively. The phase sequence now represented by ABC is now the positive phase sequence, in the sense that A is ahead in time of B, and B in ahead of C, then recycles for C to be ahead of A as the waveforms continue into time. Once the first supply is so labelled with A,B, C, any 3 phase motor whose terminals are marked A, B, C are connected to the respective supply terminals A, B, C that rotates in the direction it has been manufactured to do (eg turn a pump or fan in the correct direction) will be regarded as being correctly wired. If not, two conductors of the motor must be swapped over and the two terminal labels swapped with the conductors. Now if the motor is reconnected to the supply, the motor will turn in the manufactured direction. The essential requirement in all this is that a phase sequence indicator must be tested on a known supply wired up for the socket terminals A, B, C to truly provide the positive phase sequence A, B, C in time sequence. If the phase sequence indicator reads correct that it is positive ABC, then and only then can it be used to be check other supply sockets for correct wiring of the socket(s) for positive phase sequence. "The Anti Clock Wise ABC is equivalent to Clock Wise ACB. Just analyze by placing the imaginary viewer and rotating the phases in respective directions." If it is just a convention then how can this be? I thought that if you say anticlockwise or clockwise you are effectively saying that the positive degrees will be in that direction for the phasor diagram you are drawing. Furthermore, ABC clockwise and ABC anticlockwise should be the same thing. Let me know if I am misuderstanding. what are the effects of incorrect phase sequence to the three-phase compressor? what are effects of incorrect phase-sequence to the compressor? Atico Export are the most affordable Three-Phase Compressor Trainer providers in india. What will be happend when the phase sequences of the bus bar and the alternator are mismatched in parallel operation of alternators ? What will be happend when the phase sequence between the bus bar and the alternator is mismatched at the time of parallel operation of alternators? what is the impact on the GIS equipment (ready for FAT) if the phase sequence must be changed from ABC to CBA?